At AlbThermenBad Urach you can leave daily stress behind you, find peace and immerse yourself in a world of complete relaxation. Here, at one the most beautiful and traditional spas in Europe, a source of rejuvenation and vitality awaits you. 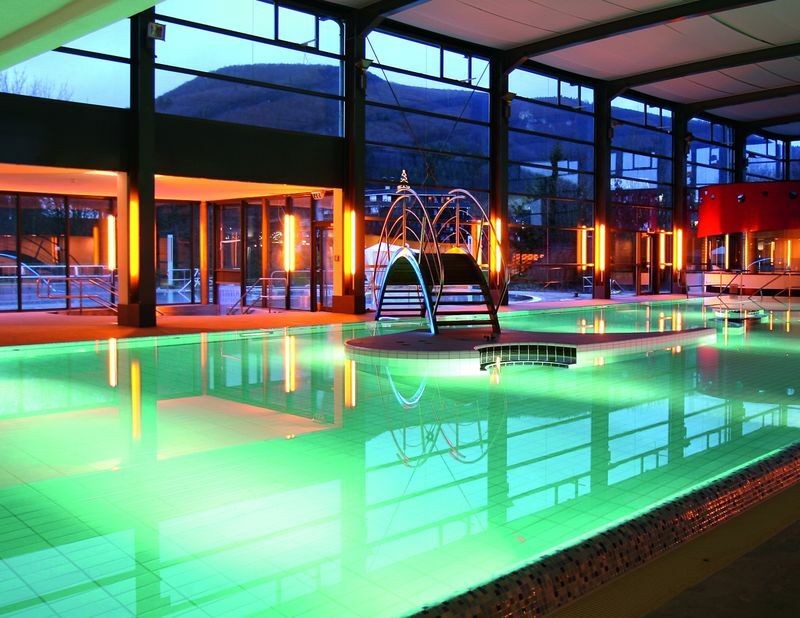 AlbThermen Bad Urach is considered one of the most beautiful and traditional spas in Europe. 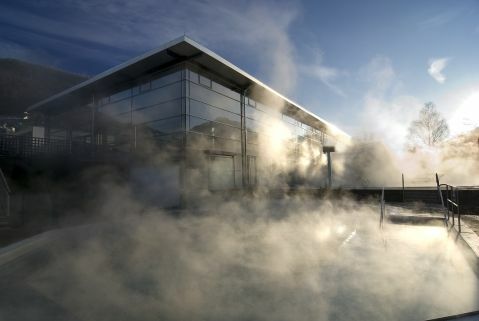 Located in the heart of the biosphere reserve, the Swabian Alps, the spacious AlbThermen thermal spa has been offering guests a unique and holistic wellness experience since 2007, including a panoramic view of the mountains and the Hohenurach Castle Ruins. Initially built in 1972, AlbThemen was redesigned and renovated in 2007 with the aim making the spa attractive for a wider audience. Ever since then – and not lastly due to the many fun theme programmes and events – AlbThermen has been attracting more and more guests each year. 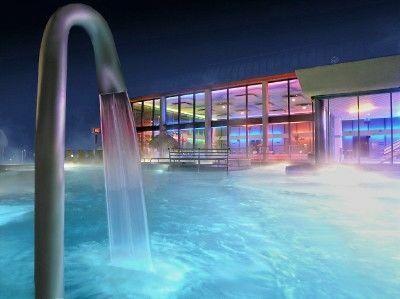 AlbThermen offers three wellness highlights for visitors: In addition to the indoor- and outdoor pools with various water temperatures ranging from 32 °C to 38 °C, AlbThermen now offers an extensively expanded indoor pool area, as well as a new relaxation pool on the same gallery level. Across 3000 sq m, the Sauna World offers seven different saunas and steam baths. Guests can enjoy the Finnish Sauna and Bio Sauna, the Stone Bath, the Outdoor Cabin Sauna, the Steam Bath, the Frigidarium, an indoor thermal pool, and a generous courtyard. Meditation-, aroma-, and ice steam sessions alternate by the hour. In the adjoined “Health- and Fitness Centre KANTO SPORTS”, guests can strengthen their endurance and vitality. The Forest Lounge, Steam Cave, Melting Pot, Alp Sun and Waterfall are our new attractions based on the theme “Swabian Alps”. The Hüle and Blue Pot have been completely renovated with new lighting designs that make them appear magical. For those who prefer clothing-required sauna and steam baths, we now offer the Melting Pot and the Steam Cave. For refreshing cooling afterwards, guests can enjoy the Waterfall with the additional option of the rain shower. The Forest Lounge is a relaxation zone with an open fire; and in the Alp Sun, infrared lamps wonderfully relax the body’s muscles. In the modernised architecture of this traditional spa, massage- and relaxation facilities have been integrated that offer guests best-possible peace and rejuvenation. A finely coordinated and variable lighting concept takes the various day- and evening times into consideration and makes this modern health- and relaxation spa seem bright and friendly even at night. AlbThermen meets guests’ every wish. A wide variety of regular and special offers and programmes offer relaxation and an experience for all ages. The daily programme comprises over a dozen individual massage offers, hydro jet and Shiatsu recliners, and much more. The lighting technology with over 4,000 atmospheric colour options immerses the spa in fascinating light every evening at dusk. Relaxing wellness music underscores this relaxing atmosphere. For special occasions, alternating theme evenings are organised at AlbThermen. Guests can find culinary highlights at the KANTO BAR - LOUNGE. Here, fresh specialties and beverages are served. The curative effects of AlbThermen Bad Urach lie in the water itself. The especially high-quality water comes from two natural mineral water sources from a depth of 770 metres. The temperature is 61 °C. This is cooled to bathing temperature in the pools and the massage nozzles. A daily ejection of 1 million litres ensures that the 32 °C to 38 °C warm water is constantly renewed.